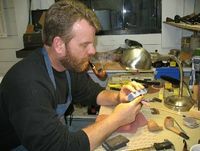 It was not surprising to his family when Andrew (Andy), ventured into handcrafting pipes. Named after his father and great grandfather, Andy is from a long line of ingenious craftsmen, engineers, and inventors. Third generation Dane, Andy named his business Quad City Pipes, after the historical Quad Cities, where the Mississippi River flows from East to West. His workshop reveals the history of the 1900's as the floor has the original stamped stone, and the home sits on a vintage red brick road. While branching out and offering his pipes through other retail outlets Andy came to the conclusion that while devoted to his Quad City heritage he wanted to get his name out there on his pipes as well as the website. So Andy launched his new website apetersenpipes.com to reflect the person instead of the place. Portrayed in the 2012 Pipe and Tobacco magazine as well as local publications, Andy has climbed the ladder quickly. Recently he was invited to spend time working alongside Alex Florov in Chicago, 180 miles from the Quad Cities. His experience working with craftsmen such as Florov leaves Andy with the desire to produce the finest smoking pipes available. This page was last edited on 2 August 2016, at 18:11.